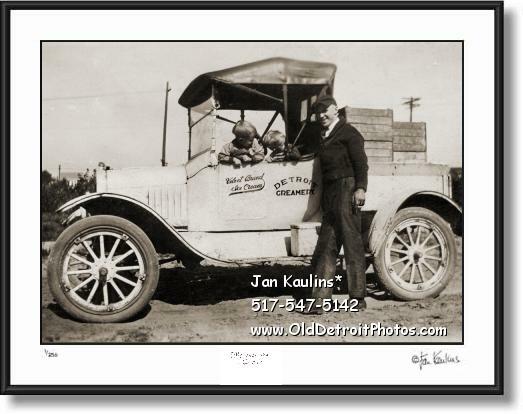 DETROIT CREAMERY VELVET ICE CREAM DELIVERY TRUCK photo picture print photograph for sale. This sepia toned old vintage DETROIT CREAMERY COMPANY and VELVET BRAND ICE CREAM delivery vehicle photo picture print for sale is an extremely rare very early image of one of the DETROIT CREAMERY Company smaller delivery vehicles packed and stacked high with wooden cases of their iconic Detroit Dairy Products. The DETROIT CREAMERY delivery driver stands next to his company vehicle as his children frolic on the front seat of what appears to be a very rare customized pick-up style delivery vehicle. The Original photo came out of a private collection and his not been previously published, making this image extremely rare and desirable to a collector of Detroit Creamery memorabilia. Judging by the vehicle this photo would date to about 1910 - 1915! The script on the side of the delivery vehicle is painted with the Company name and the name of their Velvet Ice Cream. This is a rare and wonderful piece, offered here to the public for the first time as a fine-art professionally restored Limited Edition print.